Four man buns have already fallen victim to a boozy promise. 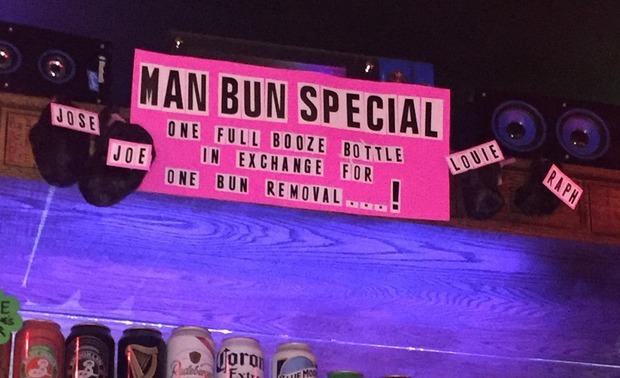 Bushwick is four man buns down thanks to the quest of a local watering hole, Boobie Trap. Who knew that all they had to do was offer up free alcohol? Four buns are nailed to the shelf in the photo above, retaining only the names of the men who left them behind for a small drop of glory and a big drop of booze. And the money they saved on alcohol can now be used for the haircut they had been putting off for months. Owner, Kristen North, says Boobie Trap does "not have a definitive 'cut off' date" for the special, but hurry in before you have no choice but to chop off your hair the old fashioned way. A brave soul loses hair for the promise of free alcohol. Featured image: the sign advertising the special featuring four fallen man buns. All photos courtesy of Kristen North of Boobie Trap.